Whiteoak Senior Traeten Hamilton (left) and Wildcats Assistant Coach John Combs chat at first base after a single by Hamilton in a SHAC baseball matchup with the North Adams Green Devils at Whiteoak High School. The Fairfield Lady Lions (6-0, 4-0 SHAC) extended their winning streak to four games in the Southern Hills Athletic Conference and six games overall to start the season with a 5-3 victory over a much improved Manchester Lady Greyhounds (4-3, 3-1 SHAC) softball team. Fairfield put together its’ most complete game of the season and got great pitching, solid defense, timely hitting and aggressive base running. The Lady Lions will be back in action at home when they host a tri against the Piketon Lady Redstreaks and cross-county rivals the McClain Lady Tigers at 11 a.m. on Saturday. The Fairfield Lions baseball team hosted the Mancheter Greyhounds on Thursday in a SHAC baseball matchup at Fairfield High School and emerged with a 7-5 win over their conference foes. The Whiteoak Wildcats continued their hot start to the season on Thursday when they hosted the Ripley Blue Jays in a SHAC baseball matchup and came away with the 15-0 five inning win with Mason Lehr dominating the Blue Jays with 12 strikeouts in the game and only two hits allowed. On Friday the Wildcats and Lady Wildcats hosted the Fayetteville Rockets and Lady Rockets in SHAC baseball and softball matchups. The Wildcats earned a 3-0 win over the Rockets to remain undefeated on the season while the Lady Wildcats were unable to handle the offensive output of the Lady Rockets and fell by a final score of 12-2. The Lynchburg-Clay Lady Mustangs hosted the Manchster Lady Greyhounds on Tuesday, April 2, in a SHAC softball game and fell to the visitors by a final score of 15-6. On Wednesday, April 3, the Lynchburg-Clay Ladies hosted SHAC rivals the Lady Rockets of Fayetteville in a game that was rescheduled from Tuesday, March 26. The Lady Mustangs beat the Lady Rockets 9-5. The Lady Mustangs were also in action Thursday, April 4, when they hosted the Lady Warriors of Eastern Brown in their third SHAC game of the week. Lynchburg-Clay lost to Eastern Brown by a final score of 16-2. The Hillsboro Indians traveled to Washington Court House on Wednesday, April 3, and battled Frontier Athletic Conference rivals the Washington Blue Lions at Washington High School and came away with a hard fought 8-4 win. Hillsboro scored seven runs in the top of the seventh inning and limited the Blue Lions to only one run in the bottom half of the inning to secure the victory. 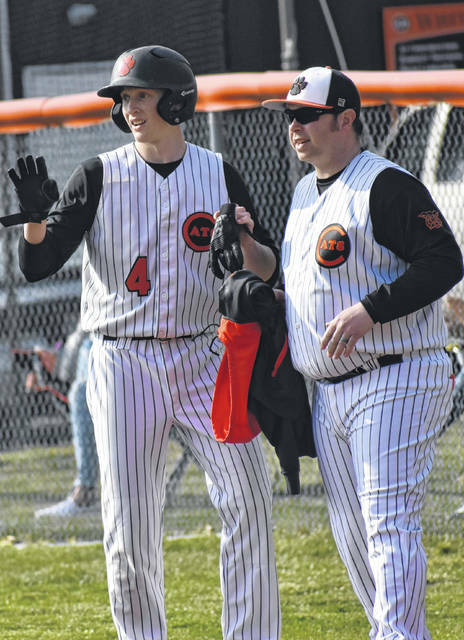 The McClain Tigers traveled to Miami Trace High School on Friday and took on the Miami Trace Panthers in a FAC baseball matchup and the Tigers secured a 2-0 start to FAC play with a 4-2 win over the Panthers. The Tigers are scheduled to be back in action Saturday when they make the short trip to Leesburg to take on cross-county rivals the Fairfield Lions in a non-conference matchup.